Please try to ignore the dots and you may get the general idea. No nets as in soccer and no crossbar as in rugby. Thanks for answering my question, Tibro. I'm so envious that you've been able to hold a koala. That's been a lifelong dream of mine, and I just couldn't believe anything that looked that adorable could smell bad! 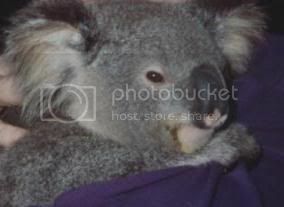 Seriously, this is a koala that I held....cute isn't he? Tibro - have you see the Royal Flying Dr Service. It was so interesting. I have seen their planes at the local airports and heard some of the interesting tales the pilots and doctors tell. The service is wonderful and many doctors and nurses apply for the experience and the travelling. He is such a sweetie and he has a good grip on your jacket! They are heavier than you would expect for their size and it is so good they are protected and so much research is going into keeping them healthy and making sure their population numbers increase. The Japanese go crazy over them. He's gorgeous! They look as if they were made specifically to be cuddled. Thanks Tibro. Interesting country, Australia. People so much like us in a country so different! Aside from the beauty and different natrually occurring things in Australia, I think Americans see Aussies as being much like us. They can be rowdy and boisterous, professional and intelligent, caring and brave and most of all, like Americans, Aussies LOVE THEIR SPORTS! It's said that there are more natural things that can kill you in Australia than anywhere else in the world. I guess when you grow up there you learn about these things so you know what to watch for. So far, there's been no mention of Dingos! Tibro....thanks for so graciously answering our questions. The Great Barrier Reef is a unique and wonderful gift of nature. I heard the late great Steve Irwin talk about it, and I hope the human impact can be minimized. I know the Aussies are doing all they can to protect it. Australia does have great medical talent. It's nice to know that when I visit Down Under, I won't have to worry if a medical issue arises. In much of the world, that wouldn't be the case. What is the top television show right now? And who is Australia's top celebrity? Hi LilPuma and pdh3 Glad to know you are enjoying my posts. I love this country so much and am enjoying sharing some of it with all the monkeys. I will work on the wildlife, including dingoes, this coming week - and yes we do have some very nasty creatures so will add them to the list too. There is a lot of similarity with our two countries and lifestyle. Sporting heroes are always celebrities and then pop music singers and film/tv actors. Only occasionally do the ones that really do the important things like medical researchers and carers, teachers and volunteer bushfire fighters etc. get the recognition they deserve. Our regular TV programmes are all in recess at present as we are in the middle of the long summer break. Kids are off school until the end of this month and in some cases mid February. Too long but it suits the teachers. I know "24" was very popular and also "Prison Break". I particularly like "Cold Case" (maybe we should send Kathryn Morris to Aruba?) and "The Unit". Other popular shows are Aussie made "Home and Away", "All Saints" (like ER), "McLeods Daughters" and a few others. Do you ever get any Aussie shows on TV there? Today I am going to indulge in a little culture and reprint a poem that was taught to us in school and is often quoted even today. It is just the best description of Aust and our feelings for this land. Hope you enjoy. The second stanza is often quoted and I am sure most Aussies could recite it from memory. We used to get McCleod's Daughters here, but they stopped showing it for some stupid reason. Lots of people complained, but so far it has done no good. I loved that show. I watched it all the time. Of course, we all watched Steve Irwin. And there are quite a few Aussies who are big over here in TV, movies, and music. A few years ago, there was also a show called Outback Jack, where this gorgeous Aussie guy met a group of American women and spent time with them in the Outback. He was supposed to pick one of them to marry, and he did. The last I heard, they were still together. His real name was Vadim Dale. Thank you so much for sharing all this info with us. I have loved every single tidbit. Since this is about as close to Australia as I will ever get in my lifetime, you have made me feel as if I know a little more than I did last week. I so look forward to hearing more about your wonderful country. Kukaburra sits on an old gum tree. Merry, merry king of the bush is he. Laugh Kukaburra, laugh Kukaburra. Kukaburra sits on an old gum tree. Eating all the gumdrops he could see. Laugh Kukaburra, laugh Kukaburra. This is fascinating. I'm not even going to ask any questions because I think it's going pretty well without my two cents. Loved the pictures. Such fabulous scenery. Sue I am sure we would all love to see them and they will fit in here nicely.